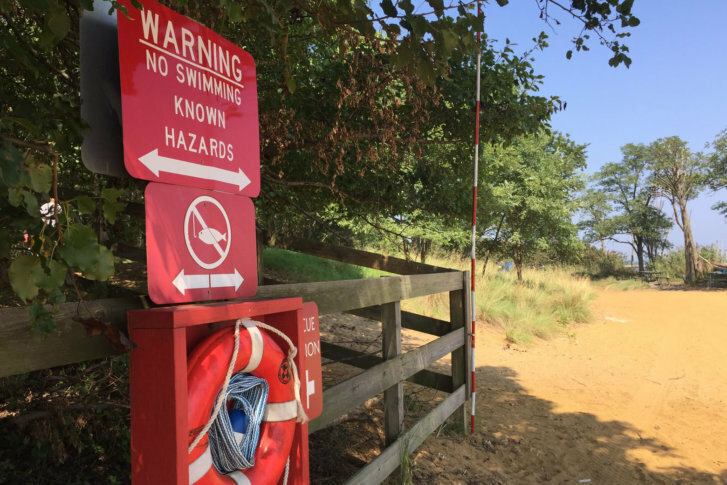 WASHINGTON — The 12-year-old Baltimore girl whose body was pulled from the Chesapeake Bay Tuesday was in an area of Sandy Point Park restricted to swimming when she was overcome by a strong current, Maryland Natural Resources Police say. After an hours-long search that involved two police helicopters and underwater imaging sonar technology, authorities recovered the body of the girl, identified as Kaniya Kenly, around 11 p.m. Tuesday. Her body was found about 40 yards from the shore. Kenly was part of a group of about 15 people from the Baltimore area who had come to the park to picnic and swim, police said. At some point, Kenly and three other children between the ages of 11 and 15, were left alone at the beach and at around 6:30 p.m. they went into the water in an area of the beach that is fenced off and marked “no swimming,” Rathgeb said. The girl began to struggle against the force of the current. Two nearby fishermen saw her struggling in the water, tried to throw her a life-ring buoy and even went in the water themselves to rescue her, but the current was too strong, Rathgeb said. There were no lifeguards around at the time because they go off-duty at 6 p.m.
Natural resources police received the call for potential drowning shortly after 6:30 p.m., Rathgeb said. Dive teams, fire and EMS crews, and two police helicopters were called in to help aid the rescue. Divers were in the water, sonar imaging was used to scan the waters and a number of rescue boats were used to look for her. First responders also searched along the shoreline. Kenly’s body has been taken to the medical examiner’s office. Ahead of the busy Labor Day holiday, Rathgeb emphasized the need for swimming safety. He said swimmers at Sandy Point park and other similar parks should stay in areas that are clearly marked for swimmers and that even experienced swimmers should be cautious about how far out they go. WTOP’s Liz Anderson and Colleen Kelleher contributed to this report.